Hello, my name is Lamin Bojang. I work at footsteps as bird and nature guide. 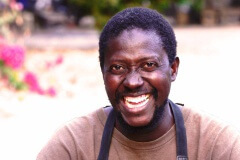 I take people to different places in the Gambia for bird and nature walk. I am also building a natural and cultural history museum in this community. I am pleased see you here to take you on my walk as a nature and bird guide. Thank you very much. Hope to see you very soon.